Dr.Premavathy Vijayan has assumed charge as Vice-Chancellor from the afternoon of 10th Aug 2016, of Avinashilingam Institute for Home Science and Higher Education for Women, Coimbatore. Dr. Premavathy Vijayan is a distinguished Professor and also Head of the Department of Special Education during 1999-2015 at Avinashilingam Institute for Home Science and Higher Education for Women, Coimbatore, India. She studied M.Sc. Foods and Nutrition and M.Ed. at Avinashilingam Home Science College, Coimbatore. She received Diploma in Special Education from Moray House College of Education, Edinburgh University, Scotland, United Kingdom in 1985-86. She entered academia in 1986 as a Lecturer in IEVH, and emerged as the Head of the Department of Special Education in 1999, and in 2014 she was promoted as the Dean of Faculty of Education at Avinashilingam Institute for Home Science and Higher Education for Women. 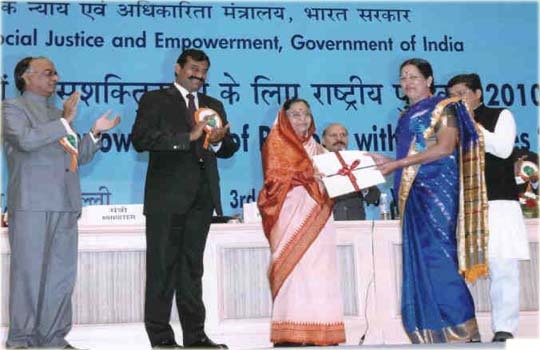 She was one of the very few pioneers in the country who implemented Inclusive Education in India. She is a Fellow/Member of Common Wealth British Council. She has participated and presented papers at numerous conferences / workshops/ seminars. She has authored / co-authored 9 books / monographs and published articles in reputed Journals. She continues to provide reviewer services to a number of journals and edited 3 books in Special Education published by IGNOU (Indira Gandhi National Open University) New Delhi. She has been conducting innovative researches in Education and Special Education for nearly 20 years. Currently she is the Director of the prestigious Indo-US research project under Obama-Singh Knowledge Initiative Project granted by the University Grants Commission, New Delhi. The Best Trainer for the Women with Visual Impairment by All India Confederation of the Blind,New Delhi in 1986.